Adobe Captivate Prime is a ground breaking new Learning Management System (LMS) from Adobe, aligned to modern business needs. Prime provides a one-of-a-kind learner experience, combining engaging gamification with a wonderfully simple learner interface – a unified fluidic player that adapts to serve every major type of media seamlessly. It was designed from the ground up with the learner in mind, and reacts to a strong demand in the LMS market to serve the needs of administrators and L&D teams. Most importantly, Adobe Captivate Prime easily provides actionable data that administrators can rely upon to tell them how effectively and how quickly their workforce is upskilling in order to align to their business goals. An image of Adobe Captivate Prime’s single fluidic player. The universal Fluidic player gets rid of the old model of crazy links and popups everywhere that has plagued LMS’ for so long. 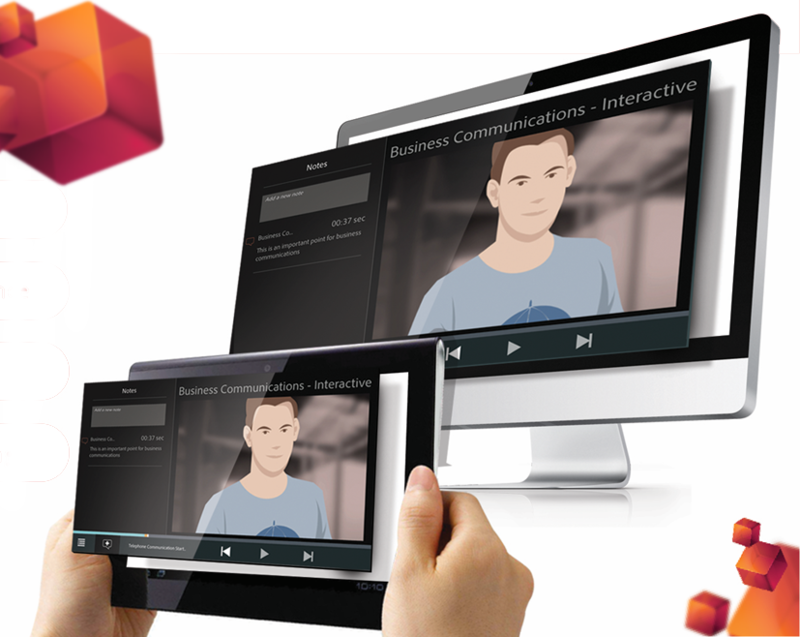 Adobe Captivate Prime uses a single universal player that, like a fluid, dynamically provides eLearning content in all major media types, and for desktop and devices all through a common player. The advantages are significant. Because Prime uses this HTML5 player, the learning experience is seamless and looks and feels like the same modern player on virtually any device. The mobile experience on Prime is full of delightful surprises. Most notably, it supports offline course playback and delayed reporting. So even if you’re away from a network, you can still take courses and the mobile player will just sync your scores and other data with the Prime servers the next time you are online. 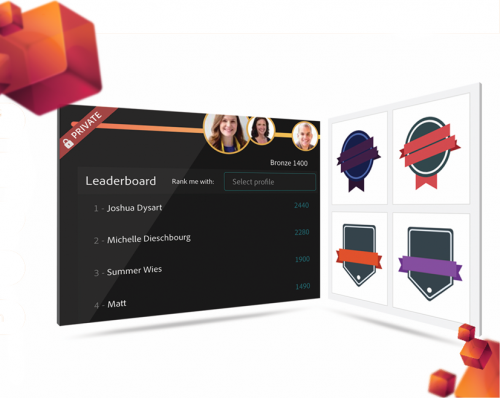 Gamification including Leaderboards & Badges, motivate learners who might otherwise find the LMS a chore by introducing friendly competition into the pursuit of new skills. Learners can compare their progress toward upskilling to the progress of friends and colleagues. Live leaderboards inspire learners to engage actively in the quest for new knowledge. Badges, leverage Mozilla’s Open Badge system to provide detailed documentation of learner achievements in the latest popular formats. Learners can even download their badges in the Mozilla Open Badge format. Once in Open Badge, learners can share their accomplishment with the world – including when and how they earned it. One simple, powerful pipeline from Concept to Compliance and everything in between. Want to standardize around Adobe products and tools? Prime has a sensational workflow and toolkit for course authors. From storyboarding with the new Adobe Captivate Draft, sharing via the Adobe Creative Cloud, authoring with Adobe Captivate & other Adobe editors, integrating virtual conferencing with Adobe Connect, to publishing with Adobe Captivate Prime, a complete Adobe eLearning solution is within your grasp. (And because we know you’ll still want to occasionally work with other tools and formats, Adobe Captivate Prime recognizes most major video formats, Microsoft Word Documents, Adobe Acrobat Documents, Microsoft PowerPoints, SCORM and AICC format eLearning – no matter what tool created it. Adobe Captivate Prime uses a fairly open architecture. Not only can you automatically include AND track detailed data about PowerPoints, Word docs, PDFs and Videos, but you can also include any SCORM or AICC compatible eLearning Content. That’s right, you can use any SCORM or AICC compatible content no matter what authoring tool created it. If that’s not enough media for you, you can also upload other format documents and files directly in the resources section of a course. Prime uses a simple modern user interface to make interaction intuitive. Adobe Captivate Prime features a flat, intuitive user interface. The result is that it feels familiar and is mobile compatible right out of the box. Many users are up and running in minutes, not months – and that means that people are quickly moving on to the work of learning new skills, rather than fighting to understand a kludgy old LMS. 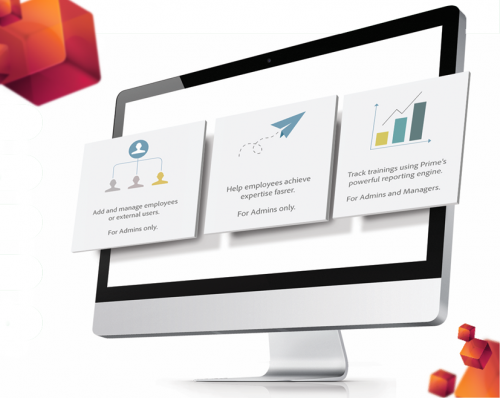 Adobe Captivate Prime features smart enrollment, allowing you to import a database of learners from your human resources directory. It learns about your workforce, including managerial relationships and then let’s you leverage that to quickly reference managers, groups, and other common clusters in order to enroll people quickly by the intuitive classifications you think of, rather than poking away for hours trying to load individuals. The HR database can be synched nightly to ensure that you have the latest records in your system every day. Captivate Prime also creates learning plans, so you can automate course and curriculum enrollment based on changes in the database of users. So when you have new hires, you can automatically assign them the core learning programs. The same thing can be used to automate learning around life events, moves, and changes in job roles. Creating and customizing catalogs in Adobe Captivate Prime. You can work with automatically discovered and custom groups of any size in Adobe Captivate Prime. The system supports both internal and external user enrollment. Course catalogs are available so that your learners can enroll themselves in courses and learning programs. Catalogs are fully searchable, with dynamically generated tags, and can easily be searched by skill in order to promote discovery of courses best suited to meet organizational goals for each learner. The learner is even given course recommendations based on the skills they’ve been assigned to master by an administrator. Adobe Captivate Prime is easy to use for non-technical administrators. Every aspect of Prime from setup to reporting has been built to simplify the process, provide power to the L&D team, managers and administrators. And to create a valuable mechanism for real-time feedback and understanding of how your training is meeting your business needs. 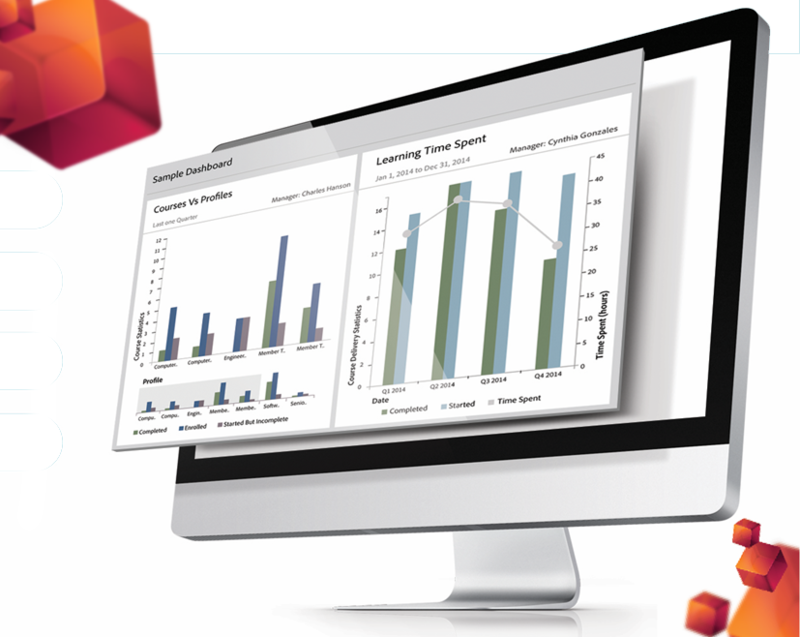 With Adobe Captivate Prime your Learning & Development managers will no longer have to wait on IT to roll-out learning programs or worry about content & LMS integration. Instead, they will be able to collaborate with business leaders to plan and deploy learning initiatives that best address the skill-gaps within your organization. You will be able to rely on Prime’s business-focused reporting to track how these initiatives are progressing and aligning against your expected business outcomes. Organizations today must leverage every resource in order to remain competitive. Sometimes we look at training and see it only as an expense rather than an opportunity. The truth is, that if training is done well, the people that make up your organization will grow in skill and their output will improve. You can take that one step further by ensuring that the skills that are enhanced are the ones that align best with your strategic plan. Adobe Captivate Prime uses skill mapping to help you align your business plan with the learning programs in your organization. The customizable dashboards and reports can be shared among managers and administrators to ensure that you’ve got the very latest information on the impact of your training efforts. Adobe Captivate Prime takes that one step further with built in support for delayed feedback from managers to determine whether or not the learner has applied the new skills on the job several weeks after completing a course. This way you have reliable third party data to help you determine whether or not training is transferred to the job, whether it is retained, and whether it is effective. Both internal and external certificates are supported in Adobe Captivate Prime. External certificates are validated by managers to ensure compliance with industry standards. You can develop or share training content related to the certifications and award certificates to learners immediately upon successful completion of the training. A wide array of customizable reports can be created in Adobe Captivate Prime. Reports can be saved to custom dashboards, and dashboards may be shared among users. Prime’s reports support interactive scanning, sizing and drill through data. Without the active participation of learners, training often becomes more of a compliance checkbox than a contributor to your business goals. We know however that a well-trained workforce has the potential to innovate and expand the profit potential of every business. If your organization is investing in learning, and looking to measure the business impact of learning, encourage employees to embrace, not dodge learning and make your L&D team self-reliant, then you should consider Adobe Captivate Prime. Prime is a cloud based LMS that automatically converts your content to HTML5. Adobe Captivate Prime is a cloud-based Learning Management System (LMS). 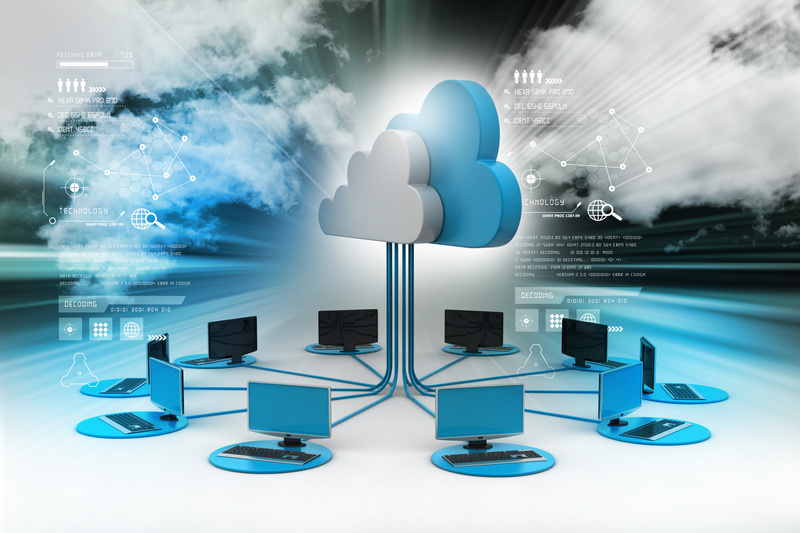 This gives it several advantages of on premise solutions. Among the benefits are enhanced physical and virtual security as well as the ability to instantly scale for growing numbers of learners, and for the ever-expanding bandwidth needs of a media hungry workforce. Adobe Captivate Prime is extensible. With modern API integration and a rapid development and update schedule, Prime is updated for you – with no need to coordinate routine updates through IT. Adobe Captivate Prime comes with Enterprise Platinum Voice support. You can get the help you need, when you want it. Our engineers monitor your data around the clock to ensure that it is safe and sound. Dawn, I’m forwarding your question to a Robohelp expert. I don’t think you can put it inside Prime, but I’ve not tried it. You could theoretically publish it inside a Captivate course using a Web Component, but I know that only works if the linked HTML is using https (when inside Prime which is all https) – have you by chance tried popping the content in using Captivate in this way? Is it possible to host a Robohelp Responsive HTLM5 help system within Captive Prime? We currently host it on our own server, which is not working well for various reasons. We are also looking for an LMS and would like to avoid having to purchase both Robohelp Server 10 and a separate LMS. Does Adobe Captivate Prime include Off-The-Shelf customizable HR training content, e.g., management basics, presentation skills, safety awareness, etc.? Additionally, can you host Instructor Led Training (ILT) or Virtual Training through it? We include Connectors – which allow you to integrate your favorite libraries, like Lynda.com and Harvard Mentor – you still would license the library from the content source, but it integrates inside the LMS with search and usually tracking (depends on the library.) Yes, it supports both ILT and Virtual training as well. Thanks Allen. What about the capability to create content directly within the LMS? Or must you create it via a separate tool, e.g., Adobe Captivate, and then upload it to the LMS? I am looking to create a online school and sell my courses. Does prime have this feature? Limos has this option and I would like to stay in the adobe family but my small business may not be able to afford the fees? Anyone else in the same boat? You can create such a solution with Prime but would have to leverage the API extension to work with your own shopping cart. We don’t include a shopping cart inside of Prime. I mostly read about Captivate Prime being used as an inner/intra-office education system for employees, is Captivate Prime appropriate for non-employees? (general public). Of course, I know these courses are all custom built into their respective websites by their web developers (I don’t want to do this as that would be a big project for me). So I would like to know, do the learners require anything on their end? or simply just a login that I provide and that is it? Do they login through their web browser? From the learner’s perspective, does it come across as them being an employee? or does just seem as though they are an individual enrolled in a course. As a side question, I get the impression that you pay for a set number of subscriptions regardless of whether you use them all, is this correct? If so, is it easy to add more learners if more sales are made? If you could please advise, that would be massively appreciated. Thank you. Yes, you can set it up so that the learner can create their own login. What they see is up to you – it is in many ways customizable. Yes it is easy to add licenses as needed. We have some customers using this sort of model already – though in at least some of those cases they are selling courses B2B – rather than as individuals. Trials are free – i’d encourage you to sign up and try it for 30 days. In my reading, I see that learners can track their progress against each other. For my purposes, I don’t want learners to be able to see each other. Is there a way to hide learners from each other in Captivate Prime? I’m looking to use the platform in a similar way in which someone would use Udemy. The learners will not be members of the organisation, the intent is to provide online courses to teach anyone who wants to learn and is willing to pay to do so. Would Captivate be appropriate for my needs? I believe you are talking about the Gamificaion data (points, rank and levels) which are visible to all the learners. And yes, there is a way to disable them. If and account admin disables Gamification for the account, learners will not be able to see each others gamification data. This is customizable. Admin can any time enable the settings and after that learners will start seeing each other gamification data. Here I would like to clear one more point that Prime does not show a leaner’s activities to other learners like how many courses one learner is enrolled into or a course is completed by who all learners. That is what I meant. The main reason is that starting out, there may not be many learners so it will leave a poor impression if learners realise that. You’ve answered my question perfectly. Thank you. Actually, sorry, regarding my other question, which is probably the more important one; Would Captivate Prime be appropriate for my purposes. I intend to release a course or possibly courses, that will be for sale to the general public, I don’t want to build/code anything and I don’t want to use Udemy or the like, is captivate a useful alternative? or is it only appropriate for employees? Is this only available on the cloud? I have a requirement to host any software on my own servers. Does anybody have a live course that is using Adobe Captivate Prime. I would like to see it in action. * Can you publish to anywhere? We generally publish to YouTube. Wishing everyone a happy and healthy everything. As we slow down and enter a new year I wanted to reach out to everyone I’ve come in contact with the past few years and thank you time, energy and friendship. My company uses a TMS to capture training content for our staff. This system is part of a much larger system, which makes it’s regular usage a requirement. Would Captivate Prime be able to automatically export this information from our TMS to it’s LMS?? 1. When a i create users by lms, each user must be an adobe account?. In other words an adobe id? 2. I uploaded an scorm module, in ipad (with the captivateprime app) permit download the module. Can i like captivate developer configure if i want to my users download or not the modules? 3. Which is the correct size to see my project on prime app in the best way, because y configure 5 responsive versions but i dont see well my project. It looks like other dimension by the captivateprime interfaz. 4. In the scorm module dont work the fordward and rewind button. 2. As i understand from your question, it seems like you would like the users to not view the module, unless they have downloaded it(Please clarify me in case i am wrong). This will not be possible. The users are allowed to download the module so that they can work offline and then later when they get on-line it gets synced. 3.The project that gets uploaded onto prime has a resolution of 1024×627 by default. So you can try the same resolution. Please let me know how the quality is getting degraded in prime app. 4 and 5. Please let me know the scorm standard that you have selected while uploading, is it scorm 1.2 or scorm 2004 and also if the learners are viewing the content on ipad through prime app or if they are viewing it on desktop. 2. In the second point my question is: In the captivate prime app, exists a button that permit to me download the content (The option is in the bottom of the module) . My question is: Can i active or inactivate this button. For example in the case that i don’t need that my users download the module? 3. In this point i have a problem. The project don´t lose quality, but the diagramming of each slide not appear property like i organized in my Captivate project. i´m using a 1024 X 627 by default in my project. 4 5. The scorm standard is 2004 (4 edition), and the learners are viewing the content on ipad through app, but the fordward and rewind button and CC button don’t work on ipad. 2.I am afraid It won’t be possible to deactivate or disable the download button. 3. I put some characters on the project at my end and when i viewed it on desktop as well as ipad, the positioning was the same. Please let me know the content that you are putting on to the project so that i can recreate the same scenario. 4.5 Unlike in Captivate, the forward and rewind buttons are not to move to the next slide but to move to the next module. So if you can add few modules into your course, you will see that the forward and rewind buttons are not greyed out and will be working perfectly. I have checked the same on ipad as well and they work fine. As far as cc is concerned, yes i was able to reproduce the issue on ipad and will be updating you soon. 2. I don’t understand this point. Do you believe that the download button won’t be possible deactivate or disable? In other words always the users can download content? 3. I have problems with the positioning of the elements in my project. For example i put text box and one image. In pc i see my project like i developed in captivate, well, but in captivate prime this elements take other positioning. For example the text runs to the right and is mounted in the text. 2. Yes, the download button is not possible to deactivate. Its just that users have been given an option to download it on to ipad and then view it without internet connectivity. Once the users get back the connectivity, the content can then sync with prime. 3. Please try creating a responsive project in tablet mode. Now after publishing it onto prime, please check if the positioning changes or not. 4.5. A captivate course can comprise of several modules, so you can navigate to these modules using the forward/rewind buttons. These buttons are used to navigate between modules of a course, not to navigate between the slides of a Captivate project. Try adding different modules to a course and you will see that the buttons are functional. Hello, this may be a strange question. I have Adobe Captivate 8 and now I have Adobe Captivate Prime. Now I want to publish learning sessions to my customers, do I need a anything more? A learning management system og Adobe Connect or whatever? I am interested in the answer to this question also. No, you don’t need anything else. You can publish your Captivate 8 courses and upload them to Captivate Prime LMS. Does Adobe Captivate Prime integrate with Salesforce? can you provide a comparison between expertus and this product please ? When will it be available in other languages e.g. German and French? I don’t have a firm date for that Matt, but it is expected to be available for other languages. I create an account and did some testing. It seems that Prime does not use responsive design to show up correctly on phones. Is that true or am I missing something? No Brian, we recommend using the tablet players for mobile playback of Adobe Captivate Prime Content. The tiny displays on mobile phones are not optimal for most learning of this type. I do find that performance support content does well on mobile phones. You’ll also find that you can of course author responsive content easily for mobile devices (regardless of orientation) using Adobe Captivate 9. Let’s say an association wants to deploy Prime, but charge members for access to courses. If an association has 10,000 members, you would not want to pay $40,000/month for Prime because only 10-20% of people might actually use it – you’d want to pay some amount for a Prime account, then charge members who want to use a course. How would that work? Can you upload question banks? What are the pre- and post-test capabilities? Can you have different types of certificates depending on the learner? You say any type of SCORM content is ok – up until recently most SCORM content was Flash (ie from Articulate products) – presumably this would not work in your HTML5 platform – what happens to the businesses who are sitting on a decade worth of SCORM SWF content? Looks like a nice product overall. Hi Mike, great questions. Let me tackle them one at a time. There are discounts for >500 licenses. Contact sales to learn more. But no, we don’t support any kind of license shifting or active only model. I think you’ll find that products that do are generally going to charge a lot more per license. You can upload Moodle GIFT format question banks into Captivate and work from there. We’ve talked about supporting quiz uploads, but there still isn’t much unanimity about which format people want supported. We offer test-out options and you can of course do post tests as desired. The legacy scorm content will run fine (even Flash) if the platform supports it. In other words, you’ll get smooth playback of swf on desktops (assuming they have plugins) but once you go to mobile (not including Windows Surface Pros here) the swf content will not play. There’s still no magic swf to html5 converted that’s reliable enough for that. I am a corporate trainer who currently works with Creative Cloud for instructional design. With the integrated sharing over Creative Cloud for Prime, does this mean that Captivate for authoring will be packaged with the Creative Cloud soon? Currently my work (California Department of Transportation) provides Adobe Connect to host my Captivate Courses. Most of the other divisions utilize Adobe Connect for the web conferencing, but our division (Construction) only utilize the course hosting side. Is there an advantage to move to Adobe Captivate Prime over continuing to use Adobe Connect? I already have over 2000 accounts for my division on Connect and about 80 hours of content. If we migrated from Connect to Captivate Prime, is there an easy way to transfer the existing learner accounts and the content? I’d encourage you to reach out for a demo. Let them know as you are setting things up that you’d like more info on API integration and we can try to get someone more technically adept than I to walk you through the specifics. Basically you create a chron script to dump the csv of your HR database to an FTP location every 24 hours (I don’t think it has to be at night.) Adobe Captivate Prime picks up the csv file at the regular intervals and then loads the changes into your system. It enables the learning plans – so you can do things like automate onboarding for new hires, job role changes etc. Some courses have to be taken at regular intervals. How does prime cope with that ? Adobe Captivate Prime uses a reminder system throughout – part of that effort to keep it simple. You just set up reminders for things, courses, certificates etc. And it politely asks you things, like how often should this certificate be updated, or is it perpetual. It can remind you based on whether you want pre-reminders or post – and even has the power to escalate reminders to supervisors – if you set it up that way. Developer access. Hi the minimum access is set at 100. Can developers access it to test or do we have to buy a 100 license ? Anyone can sign up to use Adobe Captivate Prime for free for 30 days. I use captivate to build courses then integrate it into my website using XAPI Grass blades. will prime require the same set up? I’m very interested in this product. I like the idea of being able to set up your own LMS. I have two concerns, both have been mentioned in the comments below. The first is whether or not there will be a social learning feature in Captivate Prime. it is essential for me that users can view the eLearning content, and then discuss it with the owner of the course afterwards, preferably on a forum of some sort. Secondly, if I set up a training course how do I monitor who has access to it? What is the best way to charge someone for access? Is it best to do this using a shopping cart in my own website? How does it work with the responsive Adobe Captivate projects? It scales them – as you would expect, but also note that in order to leverage the offline reporting / playback it uses players for Android and iOS. Those players are designed for tablets, and so it favors a horizontal display. By players, do you mean HTML5 player in the browser or an app users will download and install? Looking forward to your review, Craig. In regards to pricing, if a user does a course in this year, but no longer needs to do courses the next year, do their results, badges and certificates stay or do I have to keep them registered ? Their data remains in the system (so you can continue to see the info for all users) but they no longer have access to the system if you ‘unregister’ them. This is not meant to provide an option for creating ‘active’ and ‘inactive’ accounts. The model here is once registered, a user can be retired – generally on a life event that moves them out of the organization. Most of our customers use their own LMS. When you say “fluidic player” Do we have to use Captivate prime in order to run Captivate on IOS? No. Captivate remains a tool for authoring. Captivate Prime, is an independent LMS. Of course Captivate has streamlined publishing for Captivate Prime, but you can still publish for any LMS using Captivate, and still don’t have to publish Captivate content for iOS using a standalone or a player. The fluidic player in Captivate Prime is a unique solution for merging LMS content into a single unified experience. It eliminates confusion and link hopping, popups, and the need to download players – basically it’s a way to keep from pushing interruptions on the learning workflow for people using Captivate Prime as their LMS. Does Prime support LTI connections ? No LTI support Paul. We designed Prime for business, and LTI is still generally used only in education. Adobe Captivate Prime supports content that conforms to the SCORM, and AICC standards. We also support and automatically convert to HTML5, Acrobat (PDF), Word (DOCX), PowerPoint (PPTX), as well as most major video formats (which we convert to mp4 and optimize / stream, and of course Captivate and Presenter content. Are there any plans to support LTI integration in the future? Strange – I was given exclusive access by Adobe to look at the product and write a product review and yet, I am unable to mention that the review will be posted on my blog next week. Interesting. This looks very nice. I’m curious if there is a plan to add social learning functionality in the future (the ability to form communities, ask and answer questions, comment, etc.)? Also, does anyone know if there are plans to branch out with performance management functionality in the future? It seems like once you have an LMS in place, it isn’t that much of a stretch to branch out into the performance space. We of course have plans to expand and enhance Captivate Prime in various ways over time. If you’d like to know more about the product road map – I’d encourage you to reach out to us via captivateHelp (at) adobe (dot) com. So can I use this product to set up online training courses for which I charge a fee? You could do that, but Captivate Prime doesn’t contain a built in shopping cart or eCommerce application at this time. It might be possible to set something up with API and an existing shopping cart. Sounds like it might make sense to have a deeper discussion? Looks very interesting. Is there support for document management using a PDF workflow? Excellent question Trekkboss. It isn’t a document management service (eg. some of our other offerings) but I don’t think you’d have too much trouble customizing integration. We do offer a couple of ways to share PDF automatically. First you can include a PDF directly in a course. Second, you can assign various format files (including those not listed as ‘supported’ like spreadsheets and images etc.) as associated resources for a given course. I’d say it makes sense to schedule a deeper talk – we can explore what your use cases are for document management and see what solutions make sense for you. My company is in the process of putting a lot of $$ into developing an integration between our current portal system and Adobe Connect as an LMS (utilizing its On-Demand capabilities). Are we going to see a lack of development for future releases of Connect now that Adobe is trying to sell this new LMS software? Adobe Connect is still the best virtual classroom / virtual conferencing software available as far as I’m concerned. It is still in active development, and we include hooks to setup your virtual classrooms in Connect from within Adobe Captivate Prime. That’s great to hear Allen, and thanks for the reply. Unfortunately my company had specifically purchased Connect for its “on-demand” features and we don’t use the classroom/conferencing features at all. My real concern is that all the things I hoped I would see developed for Connect’s on-demand functionality (i.e. gamification, better reporting, better mobile device support) are now all current features of Captivate Prime. So will Adobe continue to make advances for Connect on that end of things? I’m with you Allen. We have invested in Connect for its LMS features, integrating it with our Active Directory to manage users. Are there plans to enhance the LMS in Connect or do I need to migrate to Prime? If so, what is the path to do that? What’s the pricing model? Per seat? It’s a per seat model Steve. Extremely interesting product, with aggressive pricing. But one glaring omission: no support for extended enterprise eLearning. It does not look like I can use this for B2B training for product certification programs etc. Will Adobe support this model in the future? Prime supports an ability to train Organization Partners by creating separate enrollment profiles for different partners. If you could reach out to us on captivateprimesales@adobe.com we would be happy to discuss your requirements in particular. But it doesn’t seem to support ecommerce to pay for such external training/certification, which we would need as well. Hi Allen. Captivate Prime is our top choice for an LMS right now, but no e-commerce is a show stopper, especially considering the interwebs is littered with adobe employees saying the feature is being considered/planned but nothing has come of it. Is there an elegant working solution that would allow us to use Prime and also have e-commerce so that we can sell some individual courses while providing others at no cost?